A short, efficient suppressor for rifles chambered in 7.62x51mm NATO and .30 caliber cartridges of similar case capacity, the Gemtech HVT sets the bar for endurance and reliability. The HVT has an unusually quiet sound signature that is indistinguishable from, and masked by, the bullet flight noise, making it ideal for both urban and rural tactical operations. Recoil and visual signature (flash, dust) are reduced greatly along with the audible signature. With our high-accuracy / low-blowback baffle design that the U.S. Navy deemed "highly favorable" in limiting rate-of-fire increase, the HVT makes for an excellent choice on automatic rifles as well as bolt-action precision rifles. Features: Caliber: 7.62mm NATO / .308. Sound Reduction: 30 dB. Length: 8.2". Diameter: 1.5". Weight: 24 oz. Material: Stainless Steel. Finish: Matte Black Cerakote with Reduced Visual-IR Signature. Mount: 5/8-24 (2A) Thread. 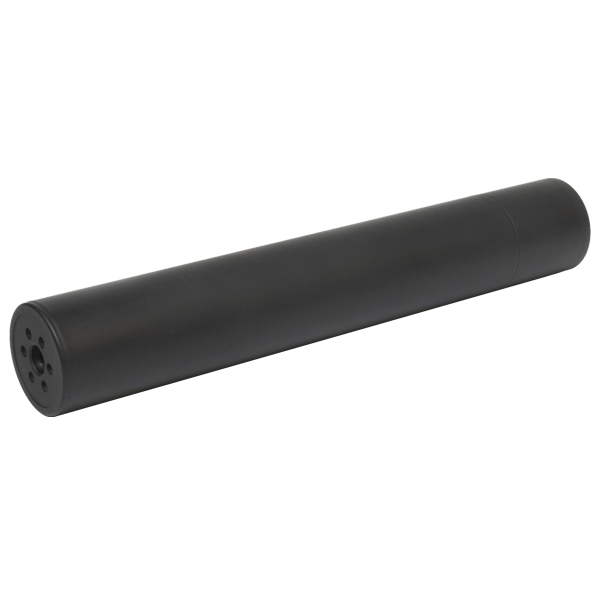 For Barrels: 16" or longer 7.62x51/.308 WIN. 10.3" or longer 5.56x45/.223. 10.3" or longer 6.8 SPC. 8" or longer 7.62x39. 7.5" or longer 300 BLK.